Queen consort and queen regent of France, daughter of Francis de Medici, Grand Duke of Tuscany, and Joanna, an Austrian archduchess, was born in Florence on the 26th of April 1573. After Joanna's death in 1578 Duke Francis married the notorious Bianca Capello, and the grand-ducal children were brought up away from their father at the Pitti Palace in Florence, where after the death of her brother and sister and the marriage of her elder sister Eleonora, Duchess of Mantua, a companion was chosen for Marie, this being Leonora Dori, afterwards known as Leonora Galigaï. She received a good education in company with her half-brother Antonio. After many projects of marriage for Marie had failed Henri IV of France, who was under great monetary obligations to the house of Medici, offered himself as a suitor although his marriage with Margaret of Valois was not yet dissolved; but the marriage was not celebrated until October 1600. 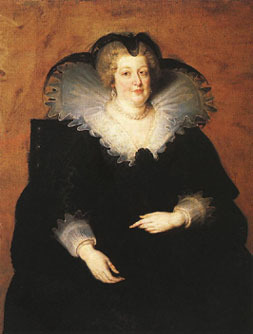 Her eldest son, the future Louis XIII, was born at Fontainebleau in September of the next year; the other children who survived were Gaston Duke of Orleans; Elizabeth Queen of Spain; Christine Duchess of Savoy; and Henrietta Maria Queen of England. During her husband's lifetime Marie de Medici showed little sign of political taste or ability; but after his murder in 1610 when she became regent, she devoted herself to affairs with unfailing regularity and developed an inherited passion for power. She gave her confidence chiefly to Concini, the husband of Leonora Galigaï, who squandered the public money and secured a series of important charges with the title of Maréchal d'Ancre. Under the regent's lax and capricious rule the princes of the blood and the great nobles of the kingdom revolted; and the queen, too weak to assert her authority, consented at Sainte Menehould (May 15, 1614) to buy off the discontented princes. In 1616 her policy was strengthened by the accession to her councils of Cardinal Richelieu, who had come to the front at the meeting of the states general in 1614; but Louis XIII, who was now sixteen years old, was determined to throw off the tutelage of his mother and Concini. By his orders Concini was murdered, Leonora Galigaï was tried for sorcery and beheaded, Richelieu was banished to his bishopric, and the queen was exiled to Blois. After two years of virtual imprisonment she escaped in 1619 and became the centre of a new revolt. Louis XIII easily dispersed the rebels, but through the mediation of Richelieu was reconciled with his mother, who was allowed to hold a small court at Angers, and resumed her place in the royal council in 1621. But differences between her and the cardinal rapidly arose, and the queen mother intrigued to drive Richelieu again from court. For a single day the journée des dupes, the 12th of November 1630, she seemed to have succeeded; but the triumph of Richelieu was followed by her exile to Compiègne, whence she escaped in 1631 to Brussels. From that time until her death at Cologne on the 3rd of July 1642 she intrigued in vain against the cardinal.